Why Build A Research Center? The Research Center provides a warm retreat from the winter cold. 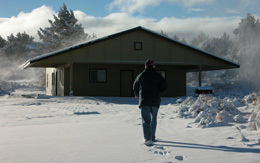 The Lava Beds Research Center is the result of a unique collaboration between the National Park Service, the Cave Research Foundation (CRF), and the Lava Beds Natural History Association (LBNHA). As the value of establishing a research facility in the Monument became more and more apparent, it also became obvious that the National Park Services was unlikely to find the funds to actually build one. CRF, keenly aware of the benefits that a research facility would bring to its work, began to explore alternatives with the Monument. The result was a three-way Memorandum of Agreement. CRF would raise the money, design the building, and hire a contractor to build it. When it was complete, they would turn the keys to the building over to the Monument. The Monument would provide a site, offer guidance, and oversee day-to-day construction. Lastly, LBNHA would serve as the banker, collecting and tracking donations, investing the funds, and paying the bills. That is precisely the way it happened. Fundraising began in 1999 and CRF volunteers put in uncounted hours soliciting funds. By early 2002 we had exceeded our initial goal of $200,000. The building plans went through multiple revisions, again consuming yet more volunteer time. Construction finally began in the spring of 2004, and the building is now in use. But the task is not done. Although construction is complete, the interior is rather bare. Before the Center can be fully functional, it needs some scientific instruments and additional furnishings. We also need to retire about $25K in no-interest loans which helped cover the final construction bills. Every penny of construction costs was donated as were the hundreds of hours spent raising funds, designing the building and overseeing construction. Help us take the final steps in making the Center fully function. Make a donation. The Lava Beds Research Center is available to anyone who wants to conduct research in the Lava Beds area. Contact David Larson, Lava Beds National Monument Resource Manager, for information. Dr.s John Tinsley and Bill Broeckle discuss a digital map of Catacombs Cave being prepared for the park. Catacombs was the site of dramatic rescue in the Spring of 2004. When the Research Center was first let out for bids, the results exceeded the budget. In response, the plans were subject to several rounds of revisions. Additional revisions were required when Siskiyou County imposed additional requirements. Diversified Contractors, Inc., of Klamath Falls Oregon, who also constructed the new Visitor Center, was selected as the general contractor. Construction of the Lava Beds Research Center finally began in May, 2004, and the foundations were completed in time for the June 12th dedications ceremonies. CRF monitored progress from afar, with only occasional visits and numerous phone conversation. Monument personnel provided the on-site daily supervision. Construction was finished prior to the Thanksgiving weekend; however the final inspection had not been completed, so first usage was delayed into early 2005.